Top O' the Mornin' to You!! I am half Irish (my mom was born in Belfast Northern Ireland) so March 17th is a special day in my family. When I was growing up, green of course was the color of the day and we always had traditional Irish food like Irish stew, potatoes and soda bread. As I got older I was introduced to the ritual and pleasure of making REAL Irish Coffee...so delicious! Today my older son will be wearing green to pre-school and we'll make sure to have some green food (broccoli!) and some special green cupcakes tonight for dinner. I will be visiting mom and bringing her a cute wooden plaque with Irish sayings for her room at the nursing home. And tonight we will sign the final papers for our new house. It's a lucky day indeed! 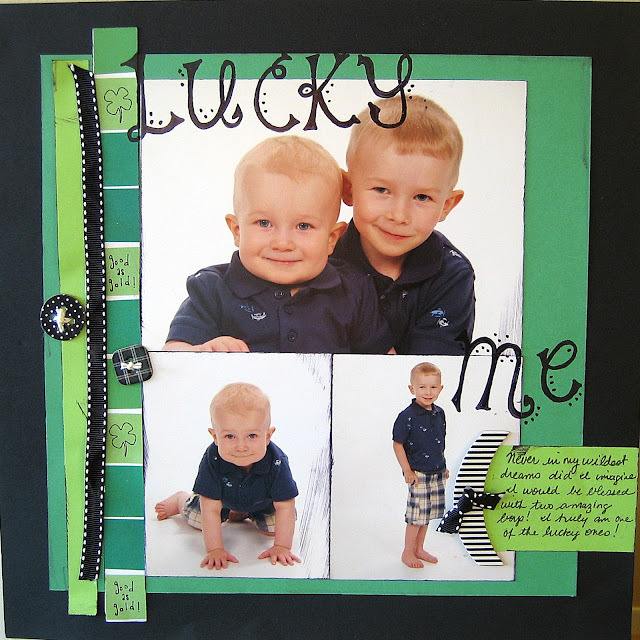 I decided to use our St. Patrick's Day thematic Page Pak to create a quick layout to show how lucky I am to be a mom to two great little boys. The luck of the Irish was surely with me when I had these two! As always, our Page Paks come with enough materials to make at least two 12x12 layouts for only $5.00, usually with leftovers! Hmm...that means I can go make another layout and maybe some St. Patricks Day cards! Happy St. Patrick's Day everyone! Note: Make sure to check out DT member Jamie Cripps St. Patrick's Day LO that was featured in Scrapbook and Cards Today Blog last week! Congrats Jamie! Your two boys are real cuties!! What a great page! This is a really good post, but I was wondering how do I suscribe to the RSS feed?